Each of these sections describes child development within a specific area of development, called a domain, which differs somewhat for each age group. A domain is an area of development such as physical health, social (how children interact with others), emotional (how children express their feelings), language and literacy (how children learn to communicate and read), cognitive (how children learn) and approaches to learning. For example, the social and emotional domain describes how kids develop the ability to express their emotions and interact with adults and other kids; the language and literacy domain describes how kids develop the skills to speak and read. This graphic orients readers to how the Guidelines are organized by domain across age ranges. The inner circle represents development for children birth to three years old. The middle circle outlines development for children three to five years old. 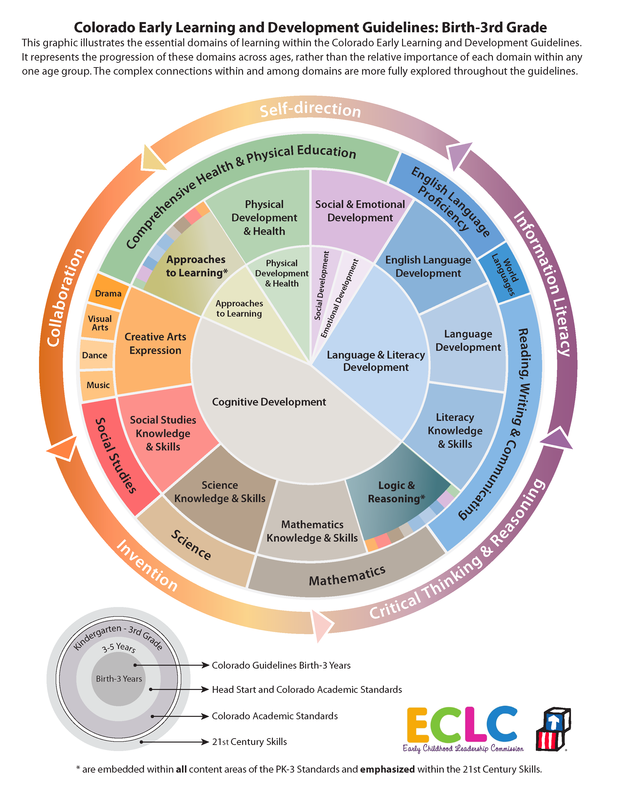 The outer circle outlines development for children five to eight years old and aligns with the Colorado Academic Standards. Within each age range, there is a description of what skills and abilities a child can typically do at a certain age and what adults can do to support the child’s growth and development. It is important to understand that each child learns and develops at his or her own individual pace and the guidelines are intended to be a used as a framework to help parents, caregivers, childcare providers and any adult who interacts with young children to easily incorporate the Guidelines into their everyday activities. Since each child is unique, caregivers should talk with a health care provider or other trusted professional about any questions or concerns. For more information about questions or concerns you may have, please contact us.